Like the 2001 space Odyssey movie by cupric I have been hearing and seeing references to this book everywhere. So, I finally got around to reading it. I gave it three stars, but that does not mean that I didn't like it. It was good and I do hereby recommended it to those interested in history, strategy, business, etc.. I gave it a three star rating because of a gut feeling of how much I think I will end up referring back to this book in the future. It was kind of like the book of Proverbs in the Bible but for war. Twas a bunch of truisms in a list like format. in fact, some of the successful battle techniques mentioned in this book were actually used by the Israelites when they were in good standing with God to defeat their enemies. 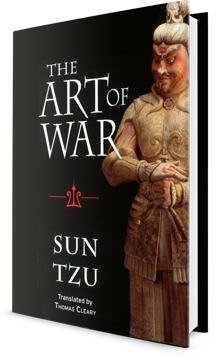 From the beginning, Sun Tzu speaks to the fact that war is horrible and should be avoided if possible but when it's unavoidable, This is how you do it… The principles are timeless and that's why it is a classic and is referred to in so many books, movies, etc. Sun Tzu lived from 544–496 BC, so his work is obviously in the public domain and anybody can republish the work. The version I read had commentary in it and was available as a digital download from my local library.